Volkswagen Commercial Vehicles has strengthened its relationship with Sky in a deal that will see the van manufacturer supply an additional 1,120 vehicles to the broadcaster’s fleet. The agreement is for 930 Caddy Maxi Startline BlueMotion Technology (BMT) and 190 Transporter Startline BMT vehicles. The vehicles, which will start to be delivered later this month, will boost Sky’s Volkswagen fleet to 2,500. 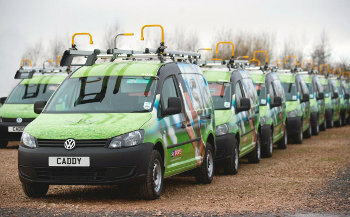 With more than 10 million TV and broadband customers across the country and thousands of Sky engineer home visits a day, the well-known Sky liveried Volkswagen vans have become a regular sight on British roads. Operational benefits for Sky include class-leading residual values, and a range of frugal, fuel-efficient engines that emit low levels of CO2, helping to save on fuel costs and reduce the fleet’s impact on the environment. Other reasons why the Sky team selected the Volkswagen Caddy Maxi include its generous load area – 4.2 m³ and a load length of 2.25 m – and high level of standard equipment, while the Transporter was also selected for its practicality and impressive fuel consumption. Sky was previously a notable fleet customer for Vauxhall’s Vivaro van, but judging from this order, the firm may be moving away from the due-for-replacement Vivaro towards the VW Transporter, for its UK fleet. All of the new vehicles, which will start to arrive from later this month, have had racking installed and will be wrapped in Sky’s livery.